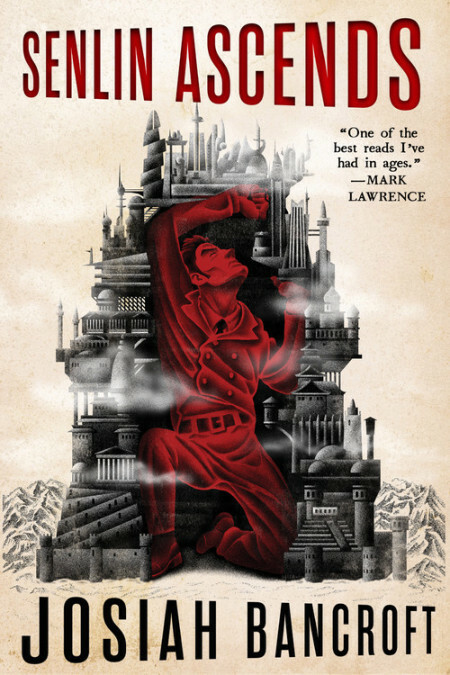 You may recall that Josiah Bancroft's Senlin Ascends received the seal of approval of both fantasy author Mark Lawrence and popular blogger Adam Whitehead a while back. That immediately piqued my curiosity and I downloaded myself a copy. Between the time of my purchase and my reading it, Bancroft's debut was picked up by Orbit and garnered a slew of positive reviews. I couldn't close the year before giving it a shot and I'm glad I did. Indeed, Senlin Ascends made it to my 2017 Top 10 SFF reads. I reckon that Josiah Bancroft's Senlin Ascends represents a dream come true for all self-published writers. How many of them dream of having a big name SFF author reading and enjoying their book, and then write a rave review that they pimp to their followers, which in turn leads reviewers to give the work a shot? That's what happened to Bancroft as part of Lawrence's Self-Published Fantasy Contest. And the rest, as they say, is history. Like Michael J. Sullivan, Anthony Ryan, and Andy Weir before him, Josiah Bancroft is the latest indie author to be picked up by a major publisher. Time will tell if his series will enjoy the same sort of commercial success as that of the aforementioned writers. It's impossible to put a label on Senlin Ascends. That's probably the best thing the novel has going for it. Believe you me, you've never read anything like it. Which is likely why the author had no choice but to self-publish it at the beginning. Since the book defies all labels, it will probably be difficult to market it adequately. It's not fantasy per se, nor is it science fiction. It's steampunk to a certain extent, but that's not it either. Truth be told, it's a strange hybrid, but one that offers a compelling reading experience. It's just unlike everything else on the market today. You can't really put it in a nutshell, is all. The Tower of Babel is incredibly vast and immensely tall. It is comprised of over forty levels called ringdoms and little is known about those above the first three or four. In his desperate search for his wife, Thomas Senlin will visit the first four; the Basement, the Parlour, the Baths, and New Babel. Each ringdom features some interesting worldbuilding and there are hints that all of them serve some greater purpose regarding the functioning of the tower as a whole. It remains to be seen if Bancroft can maintain this level of originality throughout the series. But as far as Senlin Ascends is concerned, it is evident that the author's imagination is boundless. Each ringdom features a unique and crazy world of its own, which bodes well for what will follow. I truly enjoyed the character development in this book. Thomas Senlin started off as a particularly lame protagonist, one whose optimism and pleasant disposition get him in trouble at every turn. But the Tower of Babel brings out the worst in everyone, and Senlin gradually realizes that he must change his ways in order to reach his objective. And yet, it also dawns upon him that he must soon find his wife and escape before becoming a monster like so many other denizens of the tower. The supporting cast is relatively small, but it is made up of memorable men and women that help Senlin grow as a protagonist. Josiah Bancroft's evocative prose creates an imagery that brings the Tower of Babel, its ringdoms, and its inhabitants alive. One wouldn't expect a self-published title that did not go through the editorial process with a professional editor to be that good. Senlin Ascends is cleverly written, with lots of insightful moments. Surprisingly, it's better written than many novels released by major publishing houses. Other than a few rough patches in the middle, the pace is good throughout. But this is no problem, as Bancroft keeps the majority of his chapters short and you get through those rather quickly. All in all, Senlin Ascends is an engaging, imaginative, and refreshing read featuring endearing characters whose plights make you want to discover what happens next. You know my usual policy regarding self-published works. But I'll definitely be reading the sequel, Arm of the Sphinx.